SikaBond AT-Metal Box of 12. Very good adhesion without priming on many metals and non-porous substrates. For use on porous and non-porous substrates. SikaBond AT-Metal is based on Silane Terminated Polymers. 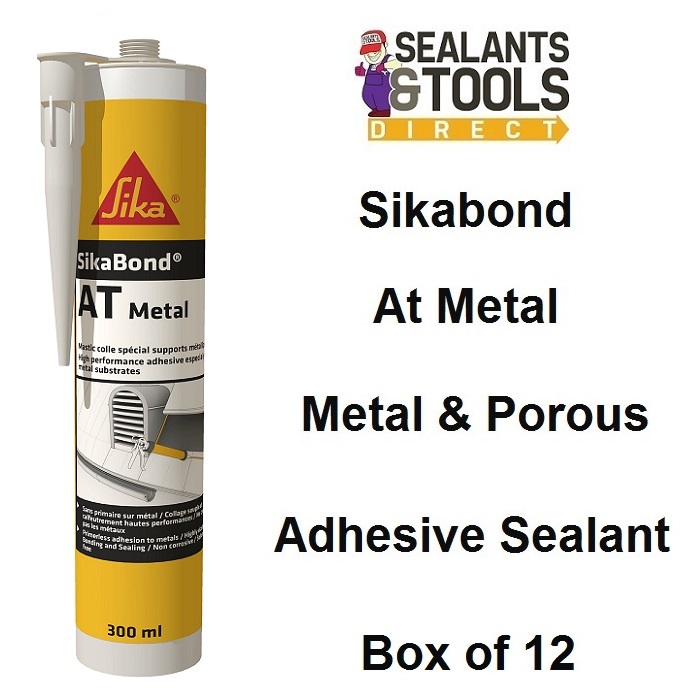 SikaBond AT Metal adhesive for both internal and external sealing & bonding of metal façade, roof elements, roof coverings, cover plates, metal. Sheet Metal, Roof Cladding, Metal Fabrication. SikaBond AT-Metal also has good adhesion on porous substrates concrete, roof tiles, mortar etc. Will also bond plastics PVC, Powder Coated Surfaces, etc. Good initial tack and fast curing. 1-part Silane Terminated Polymers (PU-Hybrid technology, moisture curing). Service Temperature -40°C to +90°C. Chemical Resistance Resistant to water, seawater, diluted alkalis, cement grout and water dispersed detergents. Sika SikaBond AT-Metal Technical Datasheet.